KANSAS CITY, Mo. (AP) Carlos Correa and the Houston Astros won their 11th straight game, finishing off a 10-0 trip by rallying past the Kansas City Royals 7-4 on Sunday. The Red Sox pulled away in the seventh against right-handed reliever Chasen Bradford, who gave up three runs and two homers while getting two outs. Bradley Jr. sent Bradford’s first pitch over the centerfield wall for his fourth home run this season. Benintendi hit his third single of the game with one out before Bogaerts put Boston ahead 8-2 with a shot into the bullpen for his 12th of the season. Boston starter Eduardo Rodriguez (9-1) picked up his sixth straight win, allowing two runs on six hits while striking out nine. MILWAUKEE (AP) – Maikel Franco homered and drove in four runs and Philadelphia held off Milwaukee’s ninth-inning rally. Rhys Hoskins and Odubel Herrera also homered to help the Phillies took two of three from Milwaukee. The Brewers are tied with Atlanta for the best record in the NL. Milwaukee trailed 10-5 going into the ninth. Jesus Aguilar led off with a home run and Eric Thames hit his second homer of the game, a three-run shot with two outs off Hector Neris. Christian Yelich followed with a drive to center and Herrera made a leaping catch for the final out, giving Jake Thompson the save. Tommy Hunter (2-0) was the winner in relief. Hoskins hit a two-run homer in the first off starter Chase Anderson (5-6). Hoskins connected for the second straight day and his 10th of the season. TORONTO (AP) – Teoscar Hernandez and Yangervis Solarte hit consecutive homers in the eighth inning, and Toronto beat Washington to complete a three-game sweep. The game was tied at 6 before Hernandez and Solarte connected against Ryan Madson (1-3). 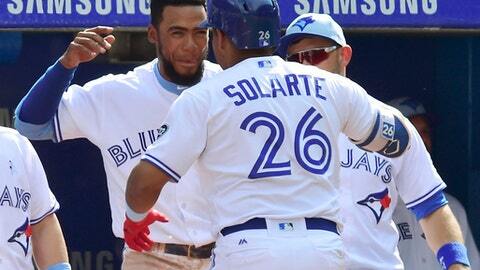 Hernandez hit his 12th homer and Solarte belted his team-leading 15th. Randal Grichuk added a pair of solo homers for the Blue Jays, who have won seven straight home games. Ryan Tepera (4-2) pitched the final 1 1/3 innings for the win. Washington has lost five of six. Slumping Nationals slugger Bryce Harper went 0 for 5 with two strikeouts, dropping his average to .218. LOS ANGELES (AP) – Nick Hundley and Brandon Belt hit two-run home runs and Chris Stratton pitched six solid innings to help San Francisco Giants avoid a three-game sweep at Los Angeles. Hundley got the Giants going with a homer in the first inning, halfway up the pavilion seats in left field for his eighth of the season. Belt followed two innings later with his 12th home run and first since returning from an appendectomy on June 1. The Dodgers saw their modest five-game win streak come to an end, but they are still 11-3 in June. They went 7-2 on their just-completed homestand and now head to Chicago for a National League Championship Series rematch with the Cubs. Stratton (8-4) gave up a first-inning run when Hundley tried to cut down Justin Turner at second base and threw the ball into center field. Hunter Strickland finished for his 14th save. Dodgers rookie Caleb Ferguson (0-1) took the loss. OAKLAND, Calif. (AP) – Jonathan Lucroy hit an RBI single off the center-field wall in the 11th inning in Oakland’s comeback victory over Los Angeles. The A’s rallied for two runs in the ninth to tie it at 5, then took advantage of control problems by a pair of Angels relievers to win. Jed Lowrie led off the 11th with a single and Jake Jewell (0-1) hit Khris Davis with a pitch. After Matt Olson flied, Eduardo Paredes replaced Jewell and walked Mark Canha to load the bases. Blake Treinen (4-1) pitched the final two innings for the victory. Albert Pujols hit his 625th career home run, Chris Young also went deep and Mike Trout reached base five times for the Angels. CHICAGO (AP) – Nicholas Castellanos homered and Blaine Hardy pitched one-run ball into the sixth, leading Detroit past Chicago for its fifth straight win. Jose Iglesias added an RBI single to help Detroit improve to 8-1 against the White Sox this season, including 6-0 at Guaranteed Rate Field. Castellanos homered twice Saturday and connected again in his first at-bat Sunday. Before Saturday, he was mired in a 1-for-21 slump over the previous five games. Hardy (3-1) allowed one run on six hits in 5 1/3 innings. James Shields (2-8) was the loser. Matt Davidson hit his 12th homer and Kevan Smith had two hits for Chicago, which has dropped four straight. ATLANTA (AP) – Julio Teheran pitched six no-hit innings before being pulled from his first start since coming off the disabled list, and Atlanta relievers gave up six hits in the win over San Diego. The Braves‘ bid for a combined no-hitter ended with one out in the seventh when Shane Carle allowed a single to Cory Spangenberg. Freddy Galvis added another single before Carle pitched out of the jam. Teheran (5-4) struck out a season-high 11. Jose Vizcaino got three outs for his 15th save. CLEVELAND (AP) – Shane Bieber pitched one-run ball into the sixth inning in his first major league win, helping Cleveland beat Minnesota. Bieber (1-0) scattered 10 hits and struck out seven in 5 2/3 innings in his second career start. The rookie right-hander was recalled from Triple-A Columbus earlier in the day when Carlos Carrasco went on the 10-day disabled list with a bruised right elbow. Yan Gomes‘ three-run double in the third snapped a 1-all tie. Cody Allen, the Indians‘ third reliever, pitched the ninth for his 14th save. Twins right-hander Jake Odorizzi (3-4) allowed four runs in five innings. BALTIMORE (AP) – Jace Peterson and Mark Trumbo homered, and Baltimore beat Miami to snap a nine-game losing streak. Baltimore also ended a string of 11 straight losses at home, which tied a club record. The Orioles‘ last win at Camden Yards was May 13 against Tampa Bay. Dylan Bundy (5-7) pitched six innings of four-run ball for last-place Baltimore. He has accounted for one-quarter of his team’s victories this season. Justin Bour homered twice for the Marlins, who went 1 for 12 with runners in scoring position. Trevor Richards (1-4) was tagged for six runs and nine hits in 3 1/3 innings. PITTSBURGH (AP) – Eugenio Suarez homered in the second straight game and Joey Votto celebrated his 1,500th major league contest by going 2 for 4 with two RBIs in Cincinnati’s victory over Pittsburgh. Suarez hit a two-run shot off Joe Musgrove (2-2) in the fourth. Votto hit a drive to deep right-center the fifth to chase Musgrove and give the Reds the cushion they would need to beat the Pirates for just the second time in seven tries at PNC Park this season. Scott Schebler added three RBIs for Cincinnati, including a two-run home run in the ninth. Anthony DeSclafani (2-1) surrendered solo home runs to Colin Moran and Gregory Polanco but otherwise kept the Pirates in check. Raisel Iglesias got four outs for his 10th save.